Of the mount equipment we've seen, which will you be using? 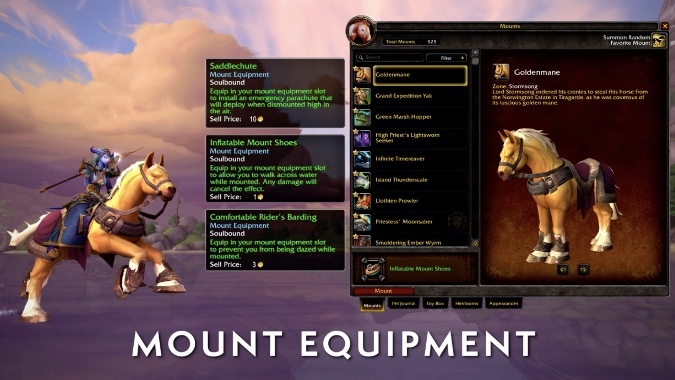 Which additional types of mount equipment would you like to see? Of the many pieces of information about World of Warcraft’s patch 8.2 that we learned during yesterday’s live stream, one of the most surprising was the addition of mount equipment to the game. It’s one of those things that, while totally unexpected, seems like a completely obvious and natural addition to the game. I mean, at one point, Blizzard removed Water Striders’ water-walking ability from Legion content because the mount became so prevalent during the beta. Why not include a way to equalize mounts? But of course, it’s not a blanket equalization — there’s an aspect of player choice involved. So far, we’ve seen samples of mount equipment that allow water-walking, prevent dazing, and provide a temporary parachute/Slow Fall if you dismount after jumping. As far as introductory “gear,” these are all incredibly solid options. Granted, as a Priest, the parachute option isn’t super important to me, but the other two are still a bigger toss-up than I first thought they’d be. I’m all for water-walking — to the point where I primarily use my Strider mount — and the Strider is apparently losing its inherent ability to water-walk when 8.2 hits… but I also reaaaaally hate being Dazed when I’m trying to run places. Then again, we’re getting flying in patch 8.2, so is water-walking really all that important? Probably not — at least for my main — so I’ll be going with the anti-Daze gear. Of course, that’s assuming these are the only three pieces of mount gear to hit with 8.2 — and maybe they will be! But what about after that? What if, as HazelNuttyGames wonders, we end up with zone-specific mount equipment? Something that will allow us to do something extra special in one zone (or expansion’s zones) at the cost of the all-around gear? Or, heck, even if we don’t get that sort of thing, what if there are better mount-equipment options out there? What would they even look like? It’s a lot to think about, and it kind of has my mind spinning coming up with options… which is why I’m turning to you. For starters, what piece of mount equipment that we’ve seen is your favorite? And more importantly, what sorts of new equipment would you like to see? What would you add to this upcoming system to make it feel truly special? Sound off below!